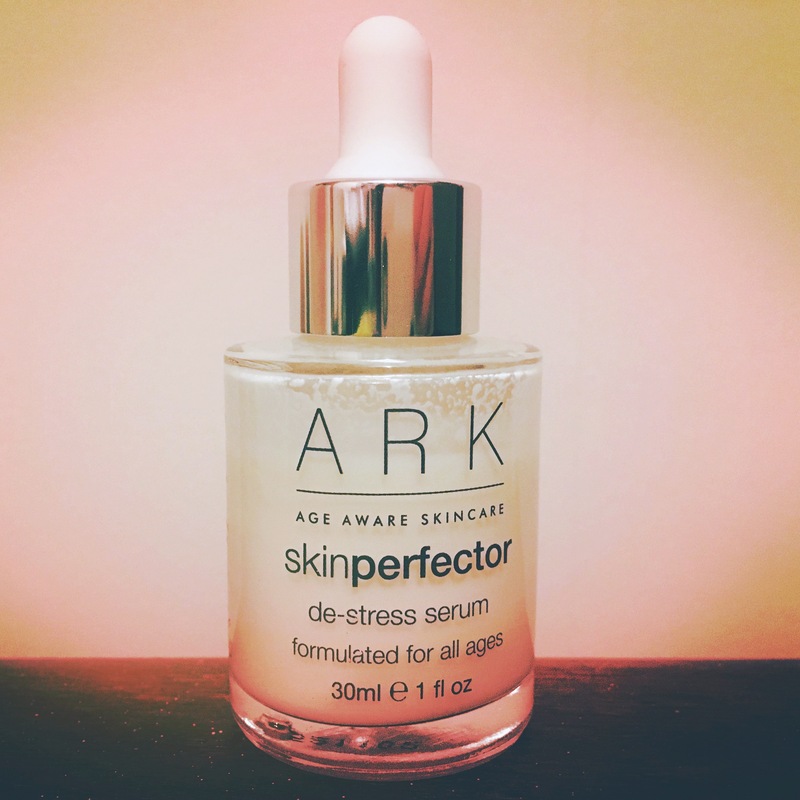 ARK Skincare’s De-Stress Serum is one of six treatment serums in ARK’s range. It’s the perfect time of year for me to talk about why this serum is so effective. Environmental stresses can play havoc with the skin. Cold air outside combined with central heating leaves the skin depleted – and the best way to describe this serum is as a second protective skin. It’s packed with antioxidants which protect the skin from free radicals. Antioxidants are a very powerful weapon when applied topically as well as ingested. The serum protects against dehydration with Vitamin E and Grapeseed Oil. It also contains a key ingredient Chamomile which calms and reduces inflammation and also helps to prevent irritation – which makes this serum ideal for people who suffer with reactive skin or rosacea. To stress ARK Skincare is HIGHLY suitable for sensitive skin. The entire range contains no parabens, lanolin, mineral oil, SD, alcohol, formaldehyde, sodium lauryl sulphate, artificial fragrance and artificial colours. It’s astounding how much skincare we pick up that does contain the long list above that we’d all prefer to avoid – even Liz Earle products contain parabens these days – probably due to the range being produced on such a large scale since it was sold to the Walgreens Boots Alliance for $140 million! It’s hard for the huge brands to produce on such a large scale without parabens. Sometimes the reason our skin reacts is lifestyle stresses – be it physical stress, allergies, not enough sleep, or food, caffeine and alcohol we’ve consumed. The De-Stress serum helps to diminish the signs of fatigue and make the skin feel protected and comfortable. Throughout February if you spend £100 at http://www.arkskincare,com a free De-Stress serum will be added to your basket. I have a hundred suggestions on what to spend the £100 pounds on! The cleanser and moisturiser suitable for your age group is a good starting point. They are £25.00 and £35.00. The Hydration Injection Masque is one of my best friends – when my skin is really tired I sleep in it. It is £35.00. I also use the Skin Protector SPF30 Primer every morning after moisturising – it’s ARK’s most famous and best selling award winning product. It is £36.00. And the Pre Cleanse and Make Up Remover is an oil cleanser that you apply directly to the skin without water over make up and it removes every single bit of mascara, foundation and grime from the day whilst leaving your skin nourished and clean. An actor friend of mine who was playing the dame in a pantomime used to use wipes and this saved the day every day! It is £30.00. The travel candles are something I take with me wherever I go. My current favourite is Vanilla Sandalwood and Amber. They come in a protective tin and are £15.00. On all of the above at ARK Skincare you can use my brand ambassador code SUSIE15 to get 15% off your order at http://www.arkskincare.com. All of ARK Skincare’s products are cruelty free, the whole facial skincare line is suitable for vegans.